NWNL: While we can’t squeeze water out of thin air, we can squeeze potable water out of salt water. Concerns over desalinization’s high cost and ecosystem degradation by its brine-y waste are now being aggressively studied and corrected. Thus, as we desperately seek more water, NWNL is interested in the values of desalination and recent adjustments to former desal processes by an expert in this field whom we recently met. Desalination is the process by which unpotable water such as seawater, brackish water and wastewater is purified into freshwater for human consumption and use. Desalination is no longer some far-fetched technology we will eventually need in a distant future to secure global water supply. Desalination technology has been used for centuries, if not longer, largely as a means to convert seawater to drinking water aboard ships and carriers. Advances in the technology’s development in the last 40 years has allowed desalination to provide potable fresh water at large scale. In the Arabian Gulf, desalination plays a particularly crucial role in sustaining life and economy. Some countries in the Gulf rely on desalination to produce 90 %, or more, of their drinking water. The overall capacity in this region amounts to about 40% of the world’s desalinated water capacity. Much of this is in Saudi Arabia, Kuwait, the United Arab Emirates, Qatar and Bahrain. The remaining global capacity is mainly in North America, Europe, Asia and North Africa. Australia‘s capacity is also increasing substantially. 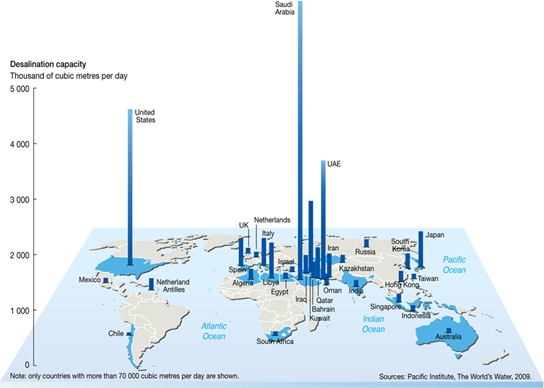 Global desalination capacity has increased dramatically since 1990 to a 2018 value of producing 105 million cubic meters of water daily (m3/day). Of this cumulative capacity, approximately 95 million m3/day is in use. Graph of worldwide desalination capacity quadrupling (1998-2018) and still growing. Estimates indicate that by 2025, 1.8 billion people will live in regions with absolute water scarcity; and two-thirds of the world population could be under stress conditions. Desalinated water is possibly one of the only water resources that does not depend on climate patterns. Desalination appears especially promising and suitable for dry regions. Proponents of desalination claim it sustains population growth; creates jobs; stops dependence on long-distance water sources; and prevents local traditional water sources from being over-exploited. It even supports development of energy industries, such as the oil and gas industries in the Middle East. As well, research and development are making desalination plants increasingly energy efficient and cost-effective. Environmental impacts of desalination plants include emission of large amounts of greenhouse gas emissions, because even with all the advances in technology to reduce energy intensity, desalination is still an energy-intensive process. While the industry continues to work on reducing energy intensity, the solution to reducing greenhouse gas emissions is to link desalination with renewable energy. Energy is the most expensive component of cost of produced water, contributing up to one-third to more than half of the cost. Renewable energy costs are now becoming competitive with fossil-fuel-generated energy in many locations where desalination is the only option available for providing potable water. As a result, more attention is turning towards de-carbonization of desalination. 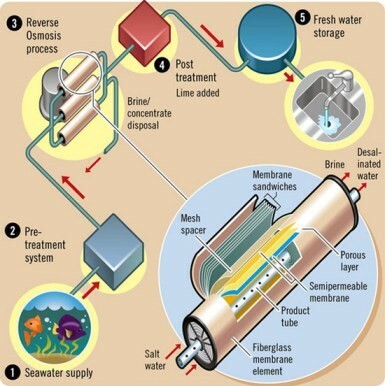 Desalination also degrades marine environments through both its intake and discharge processes. After separating impurities from the water, the plant discharges the waste, known as brine, back into the sea. Because brine contains much higher concentrations of salt, it causes harm to surrounding marine habitats. Considerable attention and investment are going towards minimizing the damage with more appropriate design of intake and discharge facilities. In the case of discharge, temperature and salt concentrations are reduced though blending prior to discharge. Ensuring discharge only at sufficient depths of sea water and spreading discharge across a very wide mixing zone will ensure sufficient and quick dilution. 5) Concentrate management and freshwater storage — handling and disposing or reusing the waste from the desalination; and storing freshwater before it’s provided to consumers. The majority of advancements in technology has happened at Stage 3, the desalination process itself. There are two main categories of desalination methods: membrane and thermal (or distillation). Until 1998, most desalination plants used the thermal process. Thereafter, the reverse osmosis (RO) desalination process (a membrane-based filtration method) took hold. The number of plants using membrane technology surpassed that of thermal, as more and more technological advancements were developed. As of 2008, membrane processes accounted for 55% of desalination capacity worldwide, while thermal processes accounted for 45%. Commercially-available membrane processes include Reverse Osmosis (RO), nanofiltration (NF), electrodialysis (ED), and electrodialysis reversal (EDR). Typically, 35-45% of seawater fed into a membrane process is recovered as product water. For brackish water desalination, water recovery can range from 50-90%. *Reverse Osmosis (RO), as the name implies, is the opposite of what happens in osmosis. A pressure greater than osmotic pressure is applied to saline water. This causes freshwater to flow through the membrane while holding back the solutes, or salts. The water that comes out of this process is so pure that they add back salts and minerals to make it taste like drinking water. Now, the Reverse Osmosis (RO) process uses significantly less energy than the thermal distillation process due to advances in membranes and energy-recovery devices. Thus, RO is the more environmentally-sustainable solution and has reduced overall desalination costs over the past decade. There are three thermal processes; multistage flash (MSF), multiple effect distillation (MED), and mechanical vapor compression (MVC), which all use the same basic principle of applying heat to create water vapor. The vapor then condenses into pure water, while separating it from most of the salts and impurities. All three thermal processes use and reuse the energy required to evaporate water. The very saline and hot Arabian Gulf and Red Sea periodically have high concentrations of organics. Until the recent advances in pre-treatment technologies, these organics presented challenging conditions for RO desalination technology. Only in the recent times, with advances in membrane science, have RO plants been reliably utilized for the large production capacities required in this region. Dual-purpose, co-generation facilities in the Middle East combine water production with electric power to take advantage of shared intake and discharge structures. This usually improves energy efficiencies by 10-15% as thermal desalination processes utilize low-temperature waste steam from power-generation turbines. These three reasons, combined with highly-subsidized cost of energy available in the Middle East, made thermal processes in the past the dominant desalination technology in this region. Amongst the three thermal processes, MSF is the most robust and is capable of very large production capacities. The number of stages used in the MSF process directly relate to how efficiently the system will use and reuse the heat that it is provided. While all the desalination technologies in use today are generally more efficient and reliable than before, the cost and energy requirements are still high. Ongoing research efforts are aimed at reducing cost (by powering plants with less-expensive energy sources, such as low-grade heat) and overcoming operational limits of a process (by increasing energy efficiency). Since the current technologies are relatively mature, improvements will be incremental. Emerging technologies such as Forward Osmosis or Membrane Distillation will further reduce electric power consumption and will use solar heat. To approach the maximum benefit of desalination, it will take disruptive technologies such Graphene membranes. They are in very early stage of development. Ultimately, no desalination process can overcome its thermodynamic limits. However, desalination is a valuable contribution to today’s increasingly-needed fresh water supplies.